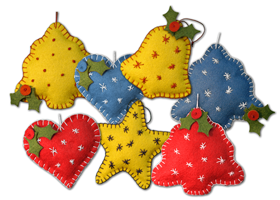 The old-fashioned Christmas ornaments kit makes three ornaments 31⁄2″ high. In the kit you will have one red, blue, and yellow ornament of the particular style. Each kit contains precision-cut wool felt, floss, needle, stuffing, and instructions. These kits are made with our wool felt which contains 20–35% wool. Suitable for age 13+.